Forget the minis. I am currently in search of the perfect maxi. Something simple and sleek that I can wear in the spring and summer. 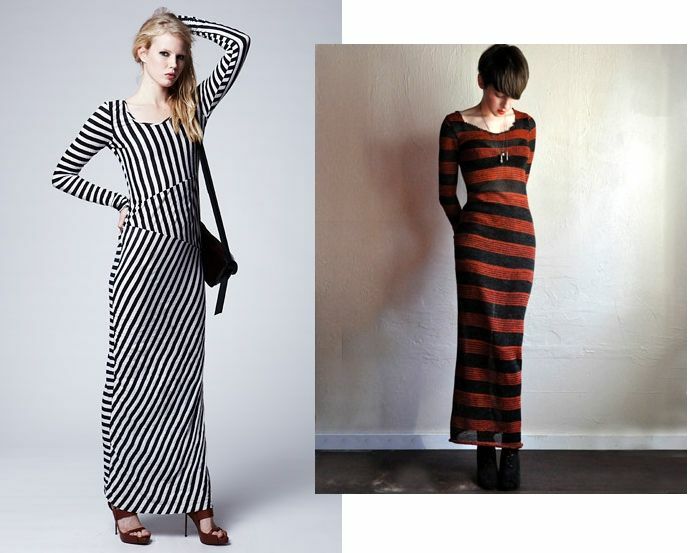 After seeing Acne and Lindsey Thornburg's striped versions, I wouldn't mind some stripes either. Or how about an all-over floral print like the one from Motel? There is just something about a long fitted dress that oozes a no nonsense elegance. The best part? You can wear practically any type of shoe with them. Be it motorcycle boots for an edgier look, sandals for a beachy bohemian feel, or heels for a more formal outing. I'm also hoping to pair it with a gorgeous necklace from The Glamourai that I've been dying to reveal for the past two months. I will let you know how my search goes. In the meantime, I am taking any suggestions for a versatile maxi that won't kill my pocketbook. Thank you! I'm looking for the perfect maxi dress(es) too. wow im really liking that lindsey thornburg dress...i always thought i'd look weird in a maxi dress since i'm on the short side...but god that dress looks comfortable and gorgeous. I love maxi dresses but they are hard to fit. Ii is difficult that they look good on me at least. Hope you find your perfect match. Grace: I know! I was drawn right away to the the Lindsey Thornburg dress even though I realized it was an homage to good ole' Freddy Krueger. The slinky material really does look sooo comfy! bravegrrl: I will definitely be taking a look on Asos! Thank you! I have yet to purchase anything on that site (even though I've been tempted to many a times). Maybe that time has come. MIA: I do love minidresses too, but I feel like I need a new silhouette in my closet. I believe Motel does make a short version too! Oh wow, I love the stripes dress from Acne. Wanting me to buy it. P.S. I appreciate your comment in my blog. Thank you so much! love that acne dress. simply STUNNING! Maxi dresses are beautiful but it is so hard to find the right one! i adore long dresses. they don't make those like they used to, either. i'm a fan of a simpler palette, but i'd be willing to do some stripes. now that the snow's melting, i might be able to actually wear them outside again. CCWai: You are absolutely right! I'm having the darnest time finding the right one. I remembered that I have a gorgeous white one stashed in my closet to wear for the summer, but now I'm looking for a darker color- preferably black or gray. love the idea of maxis, but i'm five feet tall so i'm still pondering how i'm going to pull one off...haha. without looking like a stump. i'm LOVING maxi dresses at the moment - i think im gonna make some for myself!